D&D Technologies SureClose 108SF AT90 Hinge & Closer + Snap Action (Safety Model) - Flush Mount | Hoover Fence Co.
SureClose 108 is a concealed hydraulic gate closer. It features Final Snap Action (FSA) which increases speed at the end of closing to overcome electric or coded locks. Both closing speed and FSA are adjustable using the enclosed adjustment tool. Designed to never leak hydraulic fluid, the SureClose 108 is extremely safe and does not offer resistance if closed quickly in an emergency. Soft, quiet closure also protects the latching/locking system. Tested to 500,000 open/close cyles and a 1,500 lb (680kg) point load. SureClose 108SF is suitable for pool and safety gates. SF models open to and self-close from 90°. * NO hold-open feature. *CAUTION: When used on swimming pool gates, always consult local authorities for swimming pool codes. All SureClose hinges and closers come packaged with the gate mounting bracket included. Post mounting brackets sold separately. Aluminum gate mounting brackets: Pre-drill using 3/16" (5mm) drill bit and use #14 countersunk through-bolts or fasteners. 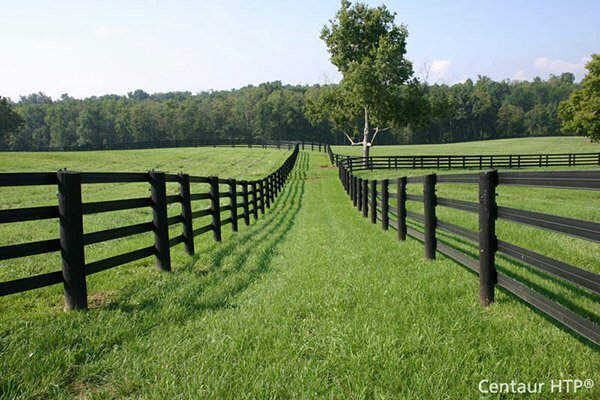 See post brackets for their fastener requirements. SureClose Gate Function Diagram (PDF). Self-closes gates up to 260lbs. **CAUTION: A gate stop must be installed when using SF models. Gate must not be allowed to open past 90°. Doing so voids warranty. Each hinge comes with its own adjustment tool (excluding SM model) and gate mounting bracket. Post mounting brackets are sold separately to custom fit the specific application. Most residential gates require only one Self-Closing Hinge paired with a Non-Self-Closing Hinge. *Yes (SF) = Gate will not hold open at 90° (OK for safety gates). 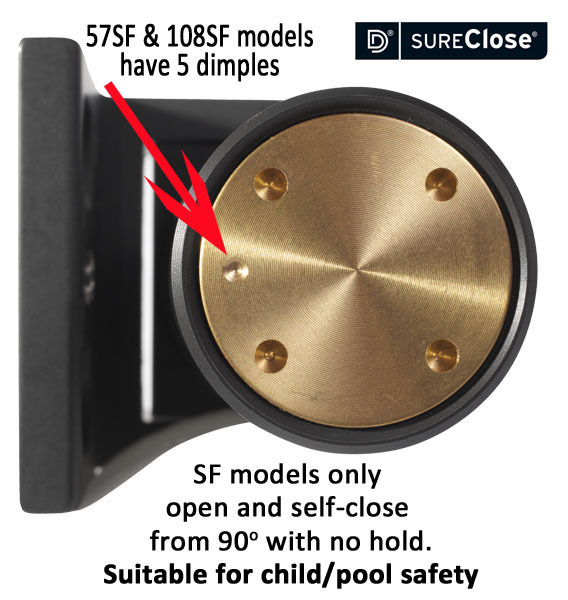 Do NOT use a hinge with a 90° hold open feature (No) for pool / child safety gates. IMPORTANT: For maximum gate weights, please see weight chart. SureClose SM hinges should only be used together with a SureClose 57SF or 108SF closer for pool / child safety gates. 75001213 SM AT90 Aluminum n/a 178° No No n/a 1/2" 2"+ 1.17 lbs. 75001214 SM AT90 Steel n/a 178° No No n/a 1/2" 2"+ 1.86 lbs. 75057213 57 AT90 Aluminum 83° 178° No No n/a 1/2" 2"+ 1.38 lbs. 75057214 57 AT90 Steel 83° 178° No No n/a 1/2" 2"+ 2.09 lbs. 75057223 57SF AT90 Aluminum 88° 88° No Yes n/a 1/2" 2"+ 1.38 lbs. 75057224 57SF AT90 Steel 88° 88° No Yes n/a 1/2" 2"+ 2.09 lbs. 75108213 108 AT90 Aluminum 83° 178° Yes No n/a 1/2" 3"+ 1.90 lbs. 75108214 108 AT90 Steel 83° 178° Yes No n/a 1/2" 3"+ 2.60 lbs. 75108223 108SF AT90 Aluminum 88° 88° Yes Yes n/a 1/2" 3"+ 1.90 lbs. 75108224 108SF AT90 Steel 88° 88° Yes Yes n/a 1/2" 3"+ 2.60 lbs. If one orders "Snap Action" Hinges, can the "Snap Action" feature be turned off? Yes, the snap action can be adjusted to virtually eliminate it from the hinge. Are all hinges and brackets made of steel? All the hinges are aluminum. The hinge brackets and post brackets can be either aluminum, for mechanically fastening, or steel for welding. What finish, if any, is on these hinges? Both the aluminum and steel components are powder coated. Do all hinges have the same diameter threaded shaft? All hinges have the same diameter threaded shaft yes. What size hole saw (for threaded shaft) is required to mount these hinges? Flush mount 1-9/16" (40mm), Center Mount 1-7/8" (48mm). Are these recommended on gates up to 40" wide only? Self-closing weights are based on a maximum gate size of 72"H x 40"W (1800x1000mm). For gates with greater HxW, or if conditions such as wind play a role, use hinge combinations with higher self-closing weight ratings. Do hinges and brackets come with installation instructions? Installation instructions are included with all hinges and post brackets.